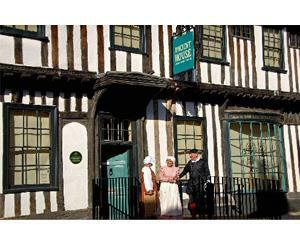 Ancient House Museum of Thetford Life01842 752599 work MuseumSet in a beautiful Tudor house with 21st century displays, this museum tells the remarkable story of Thetford and the Brecks. Discover rich collections alongside audio guides, films and animations. This magnificent timber framed Tudor merchant's house was built about 1490, with an extension added about 1590. The house is jettied and timber-framed, using oak, with wattle and daub in-fill with a fine carved ceiling and fireplace timbers. Here you can discover Thetford's connection with an Indian Prince, the Maharajah Duleep Singh. The museum, founded by Prince Frederick Duleep Singh, the Maharajah's second son, displays a range of original family photographs and items from the family's collections. Set in a beautiful Tudor house with 21st century displays, this museum tells the remarkable story of Thetford and the Brecks. Discover rich collections alongside audio guides, films and animations. This magnificent timber framed Tudor merchant's house was built about 1490, with an extension added about 1590. The house is jettied and timber-framed, using oak, with wattle and daub in-fill with a fine carved ceiling and fireplace timbers. Here you can discover Thetford's connection with an Indian Prince, the Maharajah Duleep Singh. The museum, founded by Prince Frederick Duleep Singh, the Maharajah's second son, displays a range of original family photographs and items from the family's collections. Or you might marvel at the wealth of the Thetford Treasure, a hoard of late Roman jewellery and spoons and one of the area's most dramatic finds of recent years. The Ancient House Museum displays a selection of replicas of the Treasure made by Peter Shorer, copied from the originals at the British Museum. And there are displays about Thetford's most famous son, Thomas Paine, the remarkable political writer and radical thinker of the eighteenth century, who played an important role in the American War of Independence. Adult £3.70, Concs £3.10, Family Adult £3.00, Young Person (4 - 16) £2.00, Museums Pass holders free of charge.